We sell thousands of two post and four post lifts every year. 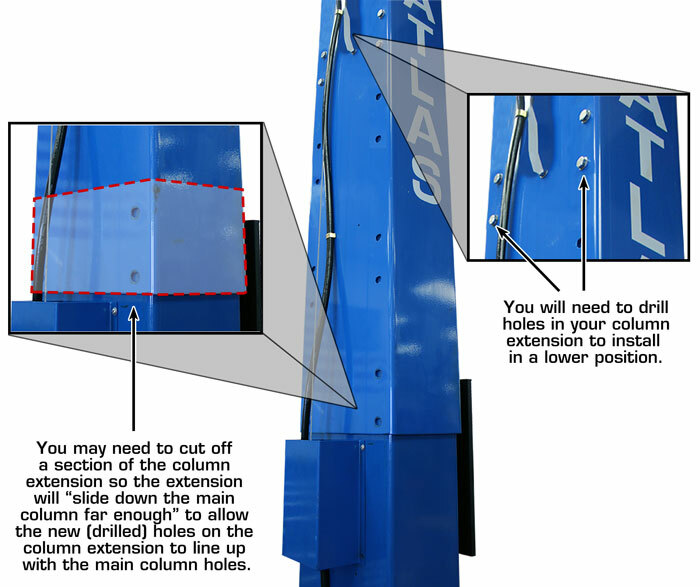 We are experts at recommending the correct Atlas® lift for your particular lifting needs. Many of our potential customers want to buy the “recommended overhead” lift, but they simply do not have enough ceiling height to accommodate this lift. Other Greg Smith Equipment Sales lift customers need to relocate their OH lift to a new building with a lower ceiling. We have outlined (below) some suggestions that may help those customer modify their OH lift. Two post OH lifts (as the name implies) have two columns. The column with the power unit (smart side) “communicates to the other column (slave side) with hydraulic hoses and wire rope equalization cables. 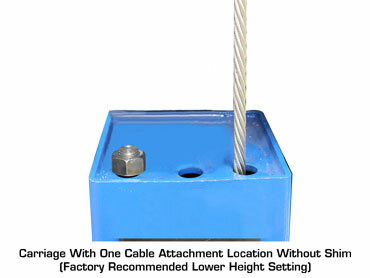 To make the lift “shorter” than the factory’s recommended height, the equalization cables need to be “shortened”. The hydraulic hoses can just be coiled a little to “make them shorter”. There is a LIMIT as to “How Short” an OH two post lift may be modified. Please ask your professional salesperson to help you determine “how low you can go”. 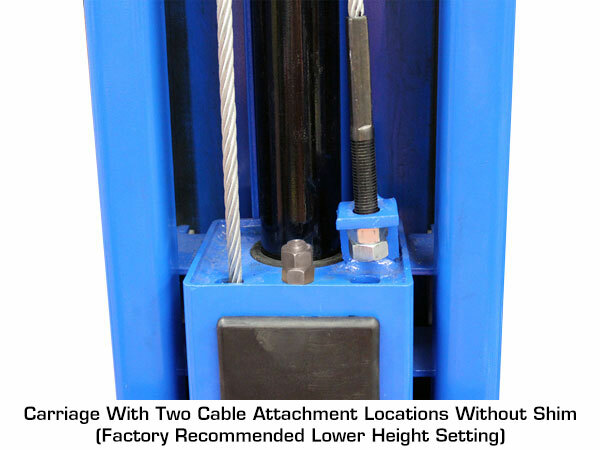 Two post above ground lifts with adjustable two piece columns may have carriages with either two cable attachment positions like the Atlas® PV-10P, or only one cable position like the Atlas® APEX-10. Single piece two post column lifts like the Atlas® OH-10X have just one equalization carriage position, and these lifts should not be adjusted. (11’ 8 “), you will need to “shorten the cable length” of EACH cable by four (4) inches. Identify the “shorter cable position attachment holes” in the carriage. Your cables will be attached to these holes and can be “shortened” by using a (shim) piece of schedule 40 pipe (4 inches long). 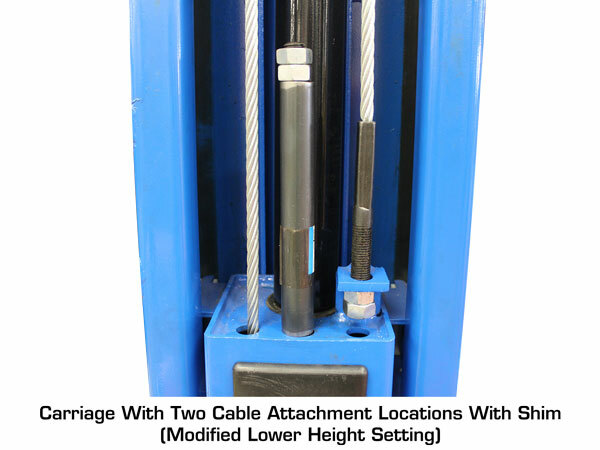 When you lower the height of your lift’s crossbar, you must shorten each equalization cable (using pipe shims) by twice the amount of “lowered height”. 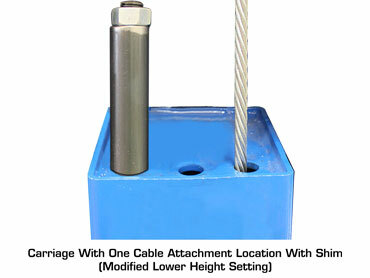 2 inches of lowered OH bar height require BOTH cables to be “shortened” four (4) inches. You will also need to drill new holes in your column extension so that the extension can be installed (mounted) in a lower position. Make sure that you can lower the column extension far enough down the main column without contacting power unit or lock covers. You may need to cut off a section of the column extension so the extension will “slide down the main column far enough” to allow the new (drilled) holes on the column extension to line up with the main column holes. This height modification will NOT affect the integrity or lifting capacity of your lift.